The demand for live online training has virtually exploded. Cost savings, as well as benefits unique to online training, make it a clear choice for trainers. 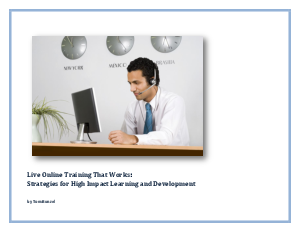 To be successful, however, online training requires a new set of strategies. This new eBook by Tom Bunzel provides proven techniques for maximizing engagement, retention and the overall effectiveness of live online training. Plus, it includes an online training resource checklist. Read the eBook to learn:- 5 principles of a successful online training program;- Tips for strategic planning and preparation;- Best practices for trainer performance.